Objective The Trans Pacific Partnership Agreement (TPP) is a recently concluded free trade agreement involving Australia and 11 other Pacific-rim nations, which has the potential for far-reaching impacts on public health. 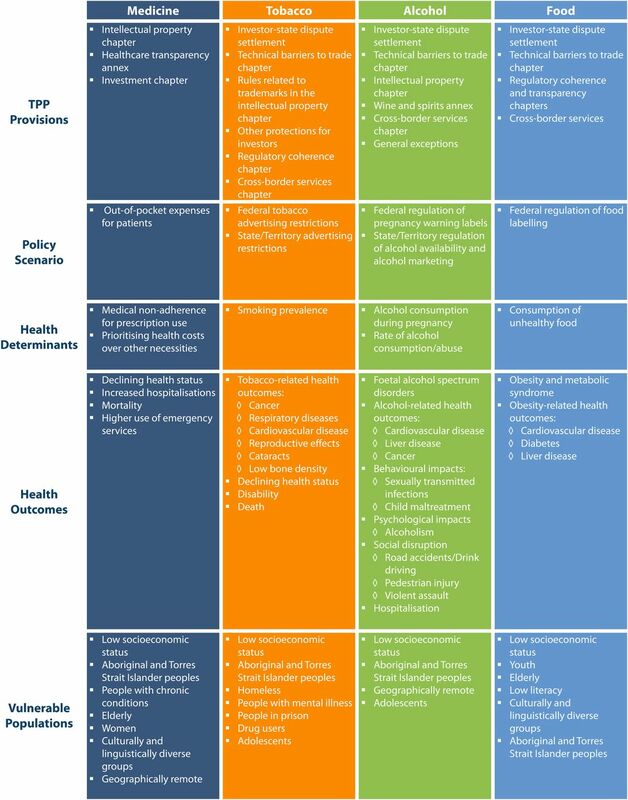 A health impact assessment (HIA) was carried out during the negotiations to determine the potential future public health impact in Australia and to provide recommendations to mitigate potential harms. This paper explores the findings and outcomes of the HIA, and how this approach can be used to provide evidence for public health advocacy. Design A modified version of the standard HIA process was followed. The HIA was led by technical experts in HIA, trade policy, and health policy, in collaboration with advocacy organisations concerned with the TPP and health. The HIA reviewed the provisions in leaked TPP text in order to determine their potential impact on future health policy. As part of this process, researchers developed policy scenarios in order to examine how TPP provisions may affect health policies and their subsequent impact to health for both the general and vulnerable populations. The four policy areas assessed were the cost of medicines, tobacco control, alcohol control and food labelling. Results In all areas assessed, the HIA found that proposed TPP provisions were likely to adversely affect health. These provisions are also likely to more adversely affect the health of vulnerable populations. Conclusions The HIA produced relevant evidence that was useful in advocacy efforts by stakeholders, and engaging the public through various media platforms. We conducted a health impact assessment (HIA) on the proposed Trans Pacific Partnership Agreement. We used scenario development to enable assessment of the proposed agreement. The HIA was used to engage health organisations in the public discourse about the trade negotiation process. As trade documents were secret, we relied on leaked drafts of the text. The Trans Pacific Partnership Agreement (TPP) is an FTA set to become the largest regional trade agreement to date, potentially covering 36.3% of world GDP.5 It includes 12 Pacific-rim nations: Australia, Brunei, Canada, Chile, Japan, Malaysia, Mexico, New Zealand, Peru, Singapore, USA and Vietnam. At the time of writing, negotiations have concluded, and the final text has been publicly released, but the agreement has not yet been signed or ratified by any participating state. The negotiation process of FTAs is usually confidential. This was the case in the TPP negotiations. The public (and public health professionals) had limited information and no access to draft texts (with the exception of leaks of a small number of chapters). Many concerns have been raised by national and international health and development organisations about the potential for the TPP to impact on public health.1 ,6–9 These include reduced access to affordable medicines, reduced effectiveness of tobacco and alcohol policies, reduced food security and poorer nutrition, increased costs of providing public health services, and pressure on the physical environment. Therefore, decisions were being made in the negotiations that have far-reaching population health impacts, but without input from the public. There is growing interest in the use of health impact assessment (HIA) as a tool for analysing and informing global economic policies.3 ,10 The WHO Commission on Social Determinants of Health recommended that HIAs be undertaken on global economic agreements.11 HIA has been demonstrated to be effective in influencing planning and policymaking both within and outside the health sector, and is recognised as playing an important role in achieving healthy public policy.12–15 Many countries use HIA to evaluate the potential health consequences of a wide array of proposals that span different sectors and levels of government.16–19 The method thus has potential for informing trade policymaking from a health policy perspective. Despite the recognised utility of HIA to inform decision-making, it is unclear to what extent HIAs can serve a role in informing the negotiation of FTAs in the context of limited access to information. This paper reports on the process and findings of a HIA conducted on the TPP during its negotiation. We use the experience of conducting the HIA to reflect on the utility of the HIA method for prospectively assessing the likely health impact of a trade agreement that is negotiated under conditions of confidentially. We adapted standard HIA methodology (figure 1) to identify the potential health impacts of the TPP. A small working group comprised mainly of HIA experts led the process. A technical committee comprised of 12 public health experts (including experts on trade agreements and the specific health policy areas under investigation) supported the working group and provided feedback on the research, scope, analysis, findings and recommendations. An advocacy advisory committee comprised of 14 civil society organisations (see Acknowledgements) supported the HIA process and used HIA findings to inform their work in the area. Members of both groups provided advice and access to evidence to inform the HIA. 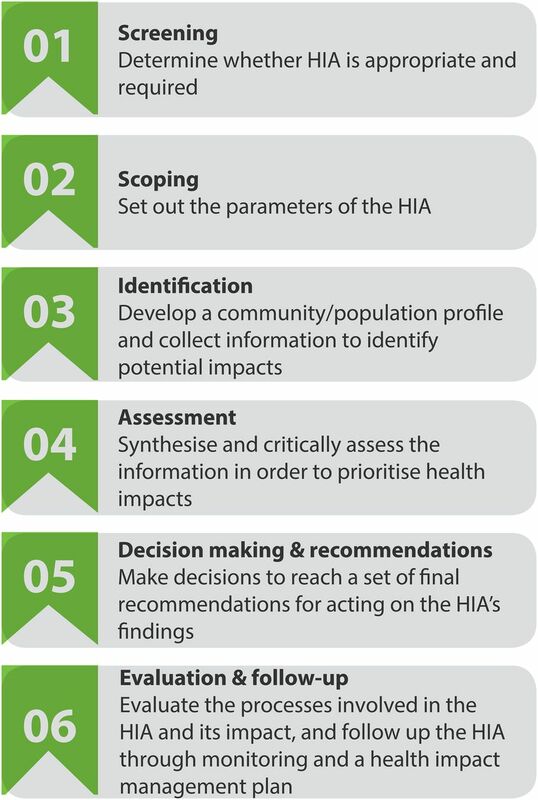 Health impact assessment (HIA) steps. Screening identifies whether an HIA is possible or useful. A team of researchers convened in December 2013 to explore how HIA could be used to inform the TPP negotiation process in Australia. HIAs can be carried out at different depths ranging from desktop assessments using already available evidence, to comprehensive assessment that involves collecting and analysing data from multiple sources requiring significant time and resources.25 Given the uncertain time frame of the negotiation process along with resource constraints and limits to the accessibility of information about the TPP provisions under discussion, it was decided to conduct an intermediate HIA, which relied primarily on secondary data from the existing literature supported by expert input. As there was little opportunity for direct input to the trade negotiations, it was decided to use the HIA to inform advocates engaged with the TPP. Scoping sets out the parameters of the HIA. The TPP HIA was faced with the difficulty of predicting impacts without the use of a publicly available proposal to assess. In the absence of public documents, the HIA used leaked texts indicating potential provisions (figure 2) along with published analysis and commentary, and formulated policy scenarios in order to conduct the assessment and predict potential impacts. Trans Pacific Partnership (TTP) chapter, or negotiating area, and possible health implications. To the best of our knowledge this is the first HIA based on leaked documents, and this is a limitation of the study. Draft chapters leaked during negotiations, to some extent represent the positions put forward by certain parties rather than the final negotiated text. However, in the absence of authorised drafts and transparent consultation, the analysis of leaked text has a recognised public interest purpose,26 and has been critical in stimulating public debate about the risks associated with proposed provisions. Based on previous trade agreements, the policy scenario is likely to be impacted by TPP provisions. The policy scenarios chosen for analysis were: the cost of medicines; restrictions on tobacco advertising; alcohol control measures including restrictions to alcohol availability and advertising, and pregnancy warning labels on alcohol containers; and requirements for food labelling. The scenarios provided examples of the ways in which the TPP could potentially affect public health policies in Australia, and the subsequent health effects from these impacts. There are many other potential ways that the TPP could impact public health, but due to the secretive nature of the negotiating process and the resource limitations of the HIA, there was no way to determine the scope of all potential policies that could be affected. Identification is the gathering of data and information about health impacts. For the HIA, we applied a range of methods including: reviewing literature for evidence about the potential impacts of trade agreements on health; accessing national data; consulting with experts; and carrying out an assessment workshop with 20 participants from 4 academic institutions and 10 advocacy organisations. Workshop participants included members of the technical and advocacy advisory committees as well as other key informants identified by the committees. This workshop was crucial to the process, as the participants were able to discuss and agree on the evidence-informed causal pathways for each scoped area and then use this analysis to identify draft recommendations. The process for agreeing on the impacts and identifying recommendations was facilitated through discussion of various questions, including: the plausibility of the impact of the TPP on the policy scenario; the significance of the policy scenario to health; the strength of the evidence; equity considerations (ie, what groups are likely to be most adversely impacted) and recommendations to mitigate potential harms. The final recommendations were subsequently revised and agreed on by all advocacy committee members. Assessment involves assessing the information and evidence to predict potential health impacts. After the causal pathways were validated through consultation with stakeholders, the research team characterised the potential impacts on health based on public health literature and stakeholder input. Impact characterisations analyse potential health impacts and characterise the changes according to various indicators.25 The following indicators were used to describe the impacts of the TPP. Speculative: may or may not happen. Plausible, but with limited evidence to support. Possible: more likely to happen than not. Direct evidence, but from limited sources. Likely: very likely to happen. Direct strong evidence from a range of data sources. Positive: impacts that improve or maintain health status. Negative: impacts that negatively affect health status. For each scoped area we identified a causal pathway that linked the potential trade provision being considered in the negotiations to a health outcome. Pathways and health outcomes, supported by the existing literature, were validated with stakeholders through the identification and assessment process. We also considered the potential for differential impacts on various sub-populations. Four causal pathways were developed, showing our analysis of impact of the potential TPP provision on the policy scenarios identified (figure 3). 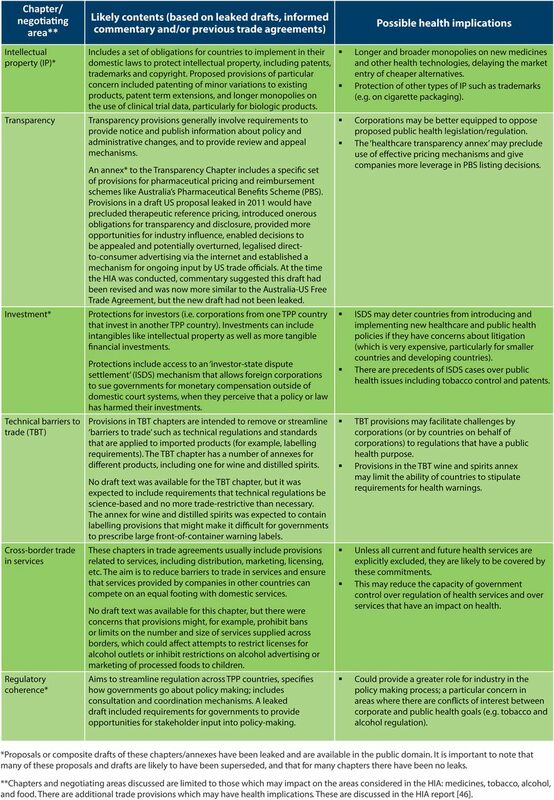 In each section below, we describe the policy scenario, the likely impact of TPP provisions under consideration during the negotiations, and the implications of these provisions for health. Australia's Pharmaceutical Benefits Scheme (PBS) provides public subsidies for prescribed medicines dispensed mainly through community pharmacies. The PBS is important not only for supporting affordable access to medicines, but also for containing healthcare costs and ensuring value for money. Many provisions proposed for the TPP had the potential to increase the cost of medicines. These were identified in leaked drafts of the intellectual property chapter;43 the healthcare transparency annex;44 and the investment chapter,45 which includes an investor-state dispute settlement (ISDS) mechanism. These provisions are summarised in figure 2 and described in more detail on pages 7–9 in the HIA report.46 These provisions, if adopted, could be expected to lead to an increase in the costs of managing the PBS by delaying the availability of generic medicines, and constraining the ability of the PBS to contain costs.47–49 An increase in the cost of the PBS to government would be likely to lead to higher copayments for patients. There is significant public health evidence that tobacco control strategies are effective at reducing rates of tobacco use.50–52 In particular, restrictions on tobacco advertising, such as plain packaging, have led to decreases in rates of smoking.53–60 Future legislation will need to maintain current control standards as well as adapt to emerging forms of use, such as electronic nicotine delivery systems, in order continue the downward trend in smoking. Despite population-level decreases, smoking prevalence has declined least in the most disadvantaged communities.53 Smoking rates among Aboriginal and Torres Strait Islander communities are more than double those in the rest of the population61 and rates of smoking are also high among homeless people,62 people who use drugs,63 incarcerated people,64 people with low socioeconomic status,65 people with mental illness66 and people in rural and remote regions.67 Tobacco policies implemented in the past have been effective at decreasing overall rates of smoking, but new and innovative interventions will be needed in the future to affect change in all populations. Certain populations are particularly susceptible to high levels of alcohol use, and are therefore disproportionately affected by a lack of alcohol control policies. Aboriginal and Torres Strait Islander populations78 and adolescents74 ,79 have higher rates of alcohol abuse; and alcohol outlet density is higher in low socioeconomic status (SES) populations.80 Existing and future alcohol control policies are required to ensure decreased risks of alcohol-related harm for these populations. There are several ways in which provisions proposed for the TPP may restrict regulation of alcohol marketing, outlet density, and pregnancy warning labels. Specifically, provisions that may impact on alcohol control policies include, among others, those contained in the chapter on technical barriers to trade;69 the wine and spirits annex;81 the cross-border services chapter69 and the investment chapter—particularly the ISDS mechanism.45 The wine and spirits annex and intellectual property chapter may limit the ability of future governments to require alcohol warning labels, while the cross-border services chapter may prohibit governments from implementing new policies around the restriction of alcohol sales.69 ,81 Other provisions, like the technical barriers to trade chapter, and ISDS mechanism, could also hinder development of innovative alcohol control policies.69 See figure 2 for summary information about these provisions, and page 16 of the HIA report for further detail.46 Any TPP provisions that hinder the ability of government to implement alcohol policies will likely negatively impact health. Provisions proposed for the TPP that have the potential to limit implementation of new food labelling requirements in Australia include the ISDS mechanism;45 the regulatory coherence chapter68 and technical barriers to trade chapter69 (see figure 2 and pages 19–20 of the HIA report46 for further detail). Provisions in these parts of the TPP have the potential to restrict policymakers to regulate using the most effective public health nutrition instruments.1 For example, the food industry could argue that introduction of mandatory front-of-pack nutrition labelling would be a technical barrier to trade.2 Without strong compensatory intervention to improve consumer awareness of the relative healthfulness of foods, it is likely that there will be no change to current high rates of obesity, metabolic syndrome and non-communicable diseases. This would have a negative impact on health, particularly for vulnerable populations. In order to mitigate the potential harms identified in the assessment, the HIA team worked with advocacy stakeholders to identify a set of recommendations (figure 4). Recommendations relevant to the specific health policy areas studied in the HIA (medicines, tobacco, alcohol and food labelling) can be found on pages 9, 13, 17 and 20 of the HIA report, respectively.46 Recommendations on the specific TPP provisions (such as not including an ISDS mechanism in the agreement) were directed towards the negotiating agency, the Department of Foreign Affairs and Trade (DFAT). They further offered recommendations to DFAT to improve the transparency of the negotiations, such as publication of draft texts and comprehensive public health consultation. It was also recommended that HIA be conducted on the final text of the TPP, but before it is signed by Parliament, as well as being conducted on all future FTAs. Health impact assessment (HIA) recommendations. The HIA process effectively engaged policy-relevant stakeholders, contributed to reframing the trade negotiations in relation to their impact on health in the public sphere, and increased the visibility of health in the trade policy agenda. Evidence for this is derived from a range of sources. The public HIA report was released in March, 2015.46 The advocacy advisory committee developed a concerted media strategy that included a joint press release which focused on the health findings of the HIA.89 In response, over March and April 2015, 50 newspaper articles referenced the HIA and its findings in periodicals from Australia, New Zealand, the USA, Malaysia and Venezuela. In the same time period, steering committee members were interviewed in 26 radio broadcasts, and ABC News conducted a primetime report on the HIA findings that included an interview with the Minister for Trade and Investment, Andrew Robb.90 This public engagement was coupled with various social media strategies employed by advocacy committee members such as blog posts, Facebook infographics, and Twitter campaigns. This fed into, and amplified, a public discourse on the trade negotiating process and lack of transparency,91 culminating in an inquiry by the Senate Foreign Affairs, Trade and Defence Reference Committee on the trade negotiating process in which the HIA report was used in public testimony.92 The HIA report was also submitted directly to the Department of Foreign Affairs and Trade and to the Senate Inquiry. Much of the media engagement and dissemination of the findings were spearheaded by key individuals, such as the CEO of the Public Health Association of Australia (PHAA), who also served as Chair of the Advocacy Advisory Committee, and representatives of the Australian Free Trade and Investment Network (AFTINET) and Choice (the leading Australian consumer advocacy organisation). The HIA was concluded prior to conclusion of TPP negotiations, allowing time for advocates to use the evidence to inform public debate. While there was little opportunity for direct input to the formal negotiations, public health advocates were able to engage with policymakers through informal channels, using the HIA as technical evidence. The findings of the HIA add to a growing body of research evidence suggesting that many TPP provisions proposed during the negotiations are likely to be harmful to health. The study also demonstrated how HIA can be used to bring a range of stakeholders together to systematically identify and examine the potential health impacts of trade agreements while being flexible enough to fit into policymaking and stakeholder time frames. Evidence of the HIA's impact shows that the process effectively engaged policy-relevant stakeholders, contributed to reframing the trade negotiations in relation to their impact on health while increasing the visibility of public health in the trade policy agenda. The uptake of the HIA in the media suggests that it may be an effective way to engage in the agenda-setting process, in the context of the TPP negotiations in Australia. As Kingdon's ‘multiple streams’ theory of policymaking highlights, windows of opportunity arise from the intersection of three streams: problem, policy and politics.21 The problem stream consists of issues that policymakers and the public want addressed, and that policymakers see as more rather than less solvable. The policy stream comprises ideas that compete to win acceptance by policymakers and their networks based on technical feasibility, value acceptability and resource adequacy, and the type of linkages and integration between different policy actors progressing particular ideas. The politics stream consists of factors such as changes to the national mood, pressure group campaigns, and administrative turnover. Across all these elements are the actions of policy entrepreneurs who are individuals or actors who attempt to couple the streams. When these three streams are coupled or joined together, the opportunity for policy influence is created. While more detailed analysis of the HIA against these dimensions is required, it is possible to identify the core attributes of the process which allowed the HIA to contribute to progressing each of these streams, increasing the possibility of a ‘policy window’ opening. Concerning the problem stream, the HIA's systematic synthesis of the evidence provided compelling and timely evidence of the problem during the negotiating period, and created a detailed assessment of the effect that proposed provisions could be expected to have on the health of Australians. Concerning the policy stream, the recommendations of the HIA report were intended to provide a set of concrete policy solutions for addressing and mitigating the effects of the TPP on health. The specific policy recommendations for the Australian Government are a point of difference from other academic work outlining more general policy issues and potential policy options at a global level. These have the potential to be much more relevant to policymakers, as they identified feasible and effective strategies (thus addressing known concerns of policymakers) to modify the TPP at the negotiation stage to improve the Agreement with respect to health. Concerning the politics stream, the HIA also gave consideration to the politics of trade policymaking and, in particular, the timing of the TPP negotiations and the players involved. By conducting the HIA prior to the finalisation of the negotiations, advocacy stakeholders could engage with the media, DFAT and members of parliament to discuss the findings of the HIA. The process engaged a wide range of policy-relevant stakeholders and was able to engage with the political dialogue via public media outlets and through formal submission and Senate Committee public testimony. The final text of the TPP was released in November 2015. It is likely that the text of the final agreement will be scrutinised for some time yet, with experts considering what the long-term implications will be. Preliminary assessment of the final text suggests that some of the more harmful provisions have been mitigated, but concerns remain. Two examples are provided below. The HIA found that a range of provisions proposed for the TPP during the negotiations had the potential to negatively impact the health of Australians, particularly for disadvantaged population groups. Provisions proposed for the TPP may increase the cost of medicines and prevent or impede the adoption of effective public health policies to regulate tobacco, alcohol and processed foods. While the outcomes for public health are mixed, many of the more harmful provisions were mitigated to some extent prior to the conclusion of the negotiations. To a large degree, the outcomes in key areas (such as biological medicines and tobacco control) have been credited to the Australian Government's refusal to bow to pressure from the USA during the final stages of the negotiations. It seems likely that the HIA findings and the public debate it stimulated made a contribution to this resolve. Findings suggest that HIA provides a useful method for reviewing and synthesising evidence, and predicting likely policy and health impacts in the context of trade negotiations. HIA, in this case, was particularly useful for mobilising advocacy and creating a window of opportunity that drew public attention to the health issues at stake in the TPP negotiations in an unprecedented way. It is important to note that a prospective HIA based on proposed provisions during the negotiation process (in the context of limited information) does not hold the same value as a comprehensive HIA on publicly available text of the TPP. One of the recommendations of the HIA was that an equity-focused HIA be conducted on the final text of the TPP before it is signed. The following organisations contributed greatly to the health impact assessment through their participation on the advocacy advisory committee: Australian Federation of AIDS Organisations, Australian Health Promotion Association, Australian Healthcare and Hospitals Association, Australian Medical Students Association, Consumer's Health Forum, Doctors Reform Society, Foundation for Alcohol Research and Education, Médecins Sans Frontières Australia, Mental Health Council of Australia, NSW Nurses and Midwives Association, Public Health Association of Australia—Chair. Unitaid. The trans-pacific partnership agreement: implications for access to medicines and public health. Genenva: Unitaid World Health Organisation, 2014. World Health Organisation (WHO). Closing the gap in a generation. Geneva: Comission on Social Determinants of Health, 2008.
. Past achievement, current understanding and future progress in health impact assessment. Oxford: Oxford University press, 2013.
. The use of health impact assessment across Europe. In: Ståhl T, Wismar M, Ollila E, et al., eds. Health in all policies: prospects and potentials. Helsinki: Ministry of Social Affairs and Health, 2006:209–30.
. Agendas, alternatives, and public policies. 2nd edn. Pearson, 2010.
. Making health policy. McGraw-Hill Education (UK), 2012.
. Health Impact Assessment: A practical guide. Sydney: Centre for Health Equity Training, Research and Evaluation, Part of the UNSW Research Centre for Primary Health Care and Equity, 2007, pp 13–17.
. The U.S. proposal for an intellectual property chapter in the trans-pacific partnership agreement. Am University Int Law Rev 2012;28:105–202. Department of Health and Ageing—Medicines Australia. Trends in and drivers of Pharmaceutical Benefits Scheme expenditure: Report for the Access to Medicines Working Group. Department of Health and Ageing, 2013.
. Management of medicines in chronic illness: views of community pharmacists in New South Wales. Journal of Pharmacy Practice & Research 2009;39: 207–10.
. Negotiating healthy trade in Australia: health impact assessment of the proposed Trans-Pacific Partnership Agreement. Liverpool, NSW: Centre for Health Equity Training Research tand Evaluation, part of the Centre for Primary Health Care and Equity, UNSW Australia, 2015.
. The U.S. Proposal for an Intellectual Property Chapter in the Trans-Pacific Partnership Agreement. American University International Law Review. 2012;28:105–202.
. Will plain packaging reduce cigarette consumption? Economic papers. J Appl Econ Policy 2012;31:303–17. ABS (Australian Bureau of Statistics). Australian Health Survey: first results, 2011–12. Canberra: ABS, 2012. Tobacco Working Group. The Healthiest country by 2020, Technical Report 2, Tobacco Control in Australia: making smoking history. Australia: National Preventative Health Taskforce, 2009. Quit Victoria. Plain packaging of tobacco products: a review of the evidence. Cancer Council Victoria, 2011.
. Australian Drug Trends 2008: Findings from the Illicit Drug Reporting Systems (IDRS). Sydney: National Drug and Alcohol Research Centre, University of New South Wales, 2009. Australian Institute of Health and Welfare. The health of Australia's prisoners 2010. Canberra: AIHW; 2011. AIHW (Australian Institute of Health and Welfare). Drugs in Australia 2010: tobacco, alcohol and other drugs. Drug statistics series, ed. Canberra: AIHW, 2011. Australian Bureau of Statistics. National survey of mental health and wellbeing: summary of results, 2007. Canberra: ABS; 2008. ABS publication 4326.0. Australian Institute of Health and Welfare. 2010 National drug strategy household survey report. Canberra: AIHW, 2011.
. The Trans-Pacific Partnership agreement: a gold-plated gift to the global tobacco industry? Am J Law Med 2013;39:237–64.
. Safeguards for tobacco control: options for the TPPA. Am J Law Med 2013;39:382–441.
. Labelling Logic: review of food labelling law and policy (2011). Department of Health and Ageing, 2011. AIHW (Australian Institute of Health and Welfare). National Drug Strategy Household Survey 2013. Canberra, AIHW, 2013.
. Regulation of alcohol advertising: Policy options for Australia. Evidence Base 2013;2:1–37. World Health Organization (WHO). Global strategy, on diet, physical activity and health. World Health Organization, 2004. Australian National Preventative Health Agency. Promoting a healthy Australia: Smoking and disadvantage [evidence brief]. Canberra: ANPHA; 2013.
. Trans-Pacific Partnership—how do we make sense of the TPP secret negotiations? ABC, 2015. Contributors KH, FH, DG, PH and AMT conceived of and designed the study. KH and DG collected the data used in the study. KH, FH, DG, PH, AMT and SF analysed the data. KH, FH, DG, PH, AMT and SF interpreted the results of the data analysis. KH, FH and DG drafted the manuscript. KH, FH, DG, PH, AMT and SF provided critical intellectual revisions. All the authors read and approved the final submitted version of the manuscript, and accept accountability for all aspects of the work. All authors included on this paper fulfil the criteria of authorship. No one else who fulfils the criteria of authorship has been excluded as an author. Competing interests DG received funding from the Australian Research Council for research on the TPP, health and nutrition; DG has received funding from various national and international non-government organisations to attend speaking engagements related to trade agreements and health, including the TPP; DG has represented the Public Health Association of Australia on matters related to the TPP; PH receives funding from the Australian National Health and Medical Research Centre, the Australian Research Council, and the Henry Halloran Trust at the University of Sydney; AMT received funding from the Australian Research Council for research on the TPP, health and nutrition; SF received funding from the Australian Research Council for research on the TPP, health and nutrition; no other relationships or activities that could appear to have influenced the submitted work.